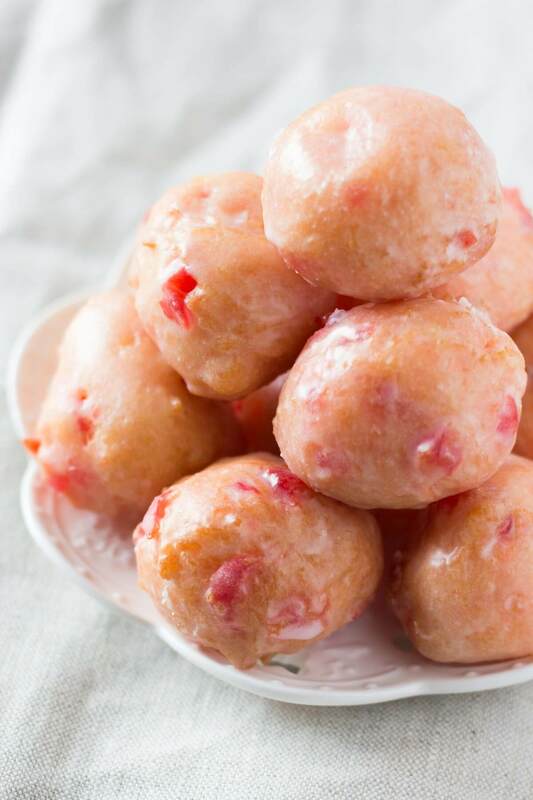 Perfect Cherry Doughnut Holes with a Sweet & Sticky Glaze – No need to visit the doughnut shop with these delicious morsels! I’ve been told you’re supposed to learn to let things go in life. Move past and move on. But when it comes to my favorite doughnut shop removing Cherry Doughnut Holes from their menu – not that easy. At first I was confused. Did they sell out? Perhaps a seasonal menu change? A world-wide shortage of maraschino cherries??? 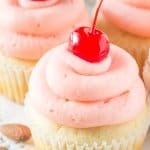 But when the sad reality set in that they had discontinued cherry happiness in bite-sized form – it was clear I would not be moving on or letting go. I’d simply have to make my own. 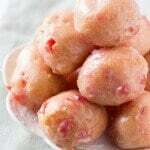 And these Glazed Cherry Doughnut Holes meet ALL the characteristics of breakfast bliss. They’re the perfect cake doughnut texture, have a sweet cherry flavor, golden edges from being deep fried, pretty pink in color and are drenched in delicious glaze. And better yet – making these doughnuts isn’t as tricky as you might think. There’s no electric mixer involved, and because we aren’t using yeast you don’t need to wait for the dough to rise. You’ll notice there’s lots of baking powder in this recipe to help the doughnuts expand & not be too dense. Then we’re using buttermilk for the softest, fluffiest texture. You could use 2% or whole milk instead, but I think buttermilk gives the best consistency. Then for our cherry flavor we’re using both finely chopped maraschino cherries and syrup/juice from the cherries. I recommend chopping up your cherries into extremely fine pieces to avoid your doughnut holes from having lumpy edges (but that’s just aesthetic). If you like a more pronounced pink color you could add a couple drops of red food coloring – but I found mine were nicely pink without it. Then for the deep frying. This is the most tricky part of the recipe, but nothing to be scared of if you’re prepared. You’ll need a deep fry thermometer clamped to the inside of a heavy bottom saucepan or Dutch oven. Then you’ll fill the pan with oil so that there’s at least 2 inches of oil in the pot and there’s at least 2 inches between the top of the pot and the oil. You’ll want the bottom of the thermometer submerged in the oil but not touching the bottom of the pot. Then once the oil heats to 350F degrees – drop spoonfuls of the doughnut batter into the oil. They’ll puff up in size as they fry, and when the edges are golden brown you can remove them from the hot oil with a slotted spoon and place on paper towel. They’ll take a few minutes to fry – depending on size. I recommend doing one doughnut hole first to test for dough-iness and the exact time you’ll need to submerge them in the oil. Then finally they’ll take a swim in the delicious sweet, sticky glaze. And are devoured of course. Homemade Cherry Doughnut Holes anyone???? Cherry Doughnut Holes made from scratch! Delicious cake doughnut texture, perfectly pink in color & dripped in sweet glaze. 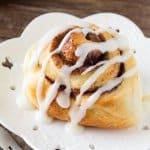 You NEED to make these! First make the glaze by whisking together the powdered sugar and cream. Set aside. 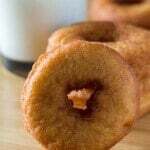 To make the doughnut batter whisk together the flour, baking powder, sugar and salt in a large bowl. Stir in the chopped maraschino cherries. In a separate bowl whisk the egg, then add in the buttermilk and cherry syrup/juice and continue whisking. 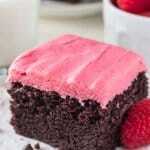 Pour the pink milk mixture into the flour mixture and fold together using a large wooden spoon or rubber spatula. Finally stir in the melted butter. Place paper towels on a flat surface, such as a cookie tray. Clamp a deep-fry thermometer to the side of a heavy bottom saucepan or Dutch oven. Heat at least 2 inches of oil in the bottom of the pan until it reaches 350F degrees. There should be at least 2 inches between the top of the oil and the top of the pot. Fry the doughnuts by carefully dropping spoonfuls (about 1-2 teaspoons in size) into the hot oil, doing about 4-5 doughnut holes at a time. Fry for about 2 minutes, using a fork or spoon to turn the doughnuts over. Remove the doughnuts from the hot oil using a slotted spoon and place on the paper towel to cool. Break your first doughnut in half to ensure they're cooked throughout, and adjust your fry time accordingly. Allow the oil to come back to 350F degrees, and repeat the process with the rest of the batter. Once the doughnut holes have cooled slightly, dip them in the glaze and then set the doughnut holes on a wire rack to dry. These were great, very easy to make and my family couldn’t stop talking about the favorite. Will be making these again thank you for sharing. This is my favorite donut recipe so far! I really love how fluffy and light they are, not mufifn-like at all! I’m trying a batch with blueberries instead of cherries right now.